Automation is the only way forward for any company looking to beat competition, and for a country like Bangladesh which has thrived in the past on cheap labour, the need is even greater. Vibemac, a 37-year-old Italian company reflecting the growing acceptance of automation in jeans manufacturing, witnessed the visitation of around 300 people from Bangladesh to enquire about new technologies on display at the CISMA. The company with its breakthrough technologies has garnered a market share of about 80 per cent in terms of automation in Bangladesh RMG industry. On display were the latest models such as 4650EV9@UP2 – a belt-loop setter; 2516V4 – an automatic back pocket setter; V2261HP – feed of the arm unit, 3 needle chainstitch; and V300 – an automatic continuous waistband unit for jeans, casual trousers and denim jackets. 4650EV9@UP2 is equipped with an auto-diagnostic system to avoid errors and a new cutting device granting much better performances. “About half of the new projects coming up in Bangladesh are of denim,” states Farhadur Rahman Jewel, Manager, Vibemac Bangladesh. The growing denim industry is a sign of Vibemac’s growth amplification in Bangladesh, a favourite and huge market for the company. Having spent 18 years in Bangladesh, Vibemac enjoys the honour of introducing automation in the Bangladesh apparel industry. Nonetheless, there are also other technology providers present in Bangladesh who offer machines at a much lower price. Usually, low pricing is an advantageous factor for these machine manufacturers. But contrary to the belief, Jewel avers, “Competitive pricing has never been a barrier to Vibemac sales.” This is a reflection of the trust which the industry has on the brand. The most important thing required to develop a technology or update it is the know-how and the experience. On the one hand, there is a company that has the experience, knows the origin of technology and how it works, and also knows how it can make further developments. On the other hand, the manufacturers with no technical expertise, only copy the recent developments without having any knowledge about the past stage and without a direction to further develop. Besides, in a production line, only 14-16 machines can be automated out of which, other machine manufacturers are able to copy the technology for only 1 or 2 machines, not the complete solution. Flexibility is another highlight of the company which it provides in machines. 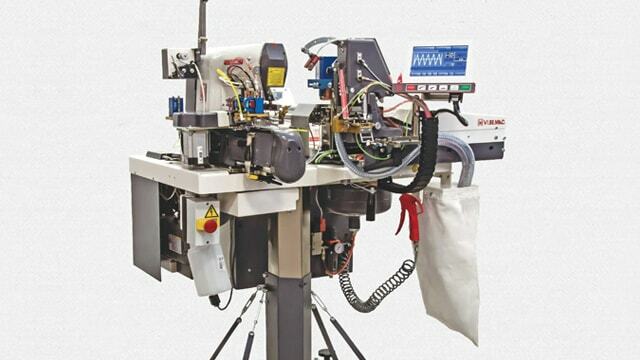 In 2008, the jeans automats specialist developed V-700 double needle chainstitch machine which provides the flexibility to be used as a single needle lockstitch when required. Also, if a user possesses the latest single needle pocket setter machine model 2516V4M, it can later be upgraded to a double needle machine. Vibemac believes that moving one step ahead of demand, is what is needed to survive. “With the changing fashion trends and quality requirements by buyers, it is not the fastest working machine which apparel manufacturers require, it is the flexibility,” avers Jewel. After-sales support is another reason Vibemac is growing. The company not only sells machines but also provides support to its customers in terms of consultation in preparing layout planning according to space available, setting up a line, machine required for a specific garment and line balancing. The clientele base of the company in Bangladesh includes big players like Pacific Jeans, Kenpark, Epic Group, Ha-meem Group, Ananta Denim Technology, amongst which Pacific Jeans owns 1,600 Vibemac machines currently. Recently, the company has completed many new projects with Square Denim, Target Denim and Beximco.